Amazon (s AMZN) is facing an unusual opponent in the battle for the lowest book prices online: Overstock.com (s OSTK), which last week announced a promotional campaign to sell its books “at least 10 percent below Amazon.com’s prices.” While that promotion was only supposed to last for a week, Overstock has decided to continue it for longer. In response, Amazon is slashing its own prices on print books. In a special report over the weekend, trade publication Shelf Awareness noted that Amazon has begun “discounting many best-selling hardcover titles between 50 percent and 65 percent, levels we’ve never seen in the history of Amazon or in the bricks-and-mortar price wars of the past.” Publishers Marketplace, however, notes that Amazon has offered similar discounts in the past when matching promotions from retailers like Walmart (s WMT). In some cases, Amazon’s hardcover prices are below the prices it’s charging for Kindle books. Overstock does not sell ebooks. As far as I can tell, Amazon is only offering the particularly deep discounts on books that Overstock also sells. The Cuckoo’s Calling — written by J.K. Rowling under the pseudonym Robert Galbraith — isn’t available at Overstock (retailers have been scrambling to get print copies of the book). At Amazon, the hardcover is selling for $15.20, a fairly customary (for Amazon) discount of 42 percent. Yet Overstock’s Top 100 list doesn’t reflect a favorable customer response, if there has been one. On that list, I didn’t see a single new bestseller — rather, most of the books on the list are old or niche titles like It’s Called Dyslexia and Word Smart for the GRE. Overstock also isn’t promoting the deeply discounted titles on its books home page; if you want that discounted copy of Dan Brown’s Inferno, you have to search for it. Overstock is largely known for offering discounts on home goods and furniture, and shoppers simply may not think to go there for books. Amazon’s shoppers, however, are certainly benefiting from Overstock’s campaign. What they do in Germany would not help the authors or publishers in the US. In a stander publishing deal in the US authors gets 2 – 6 cent per book sold. It dose not matter how much the book sold for. Then publisher then sells the book at a bulk rate to bookstore. So the difference between $30.00 and $11.00 is only profit for amazon. I do not have any idea why e-book are so much the author doesn’t make more money only the publisher at this time, but the contracts are starting to changing become of it. Interesting. These e-book sellers must be making a ton of money selling copies of something that costs little to produce other than the amount paid to the author. What this market needs is competition to drive the price of e-books down. We would all benefit! Does Canada do the same thing that Germany does? In Germany, government regulations designed to protect the publishing and book-selling industries prevent Amazon or any retailer, online or storefront, from selling a book below the list price set by the publisher. The result: Amazon can’t push down prices, independent bookstores can compete on a level playing field with online retailers and chains, and publishers and authors make a living wage. It’s time for other countries to do the same, if they value books, bookstores, authors, and publishers. 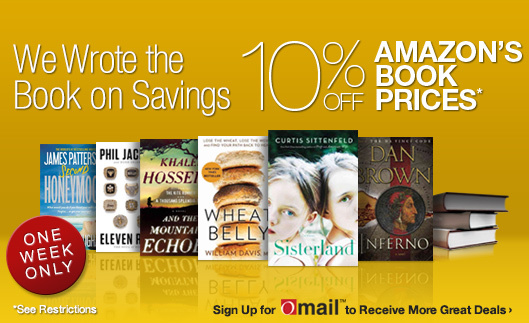 Amazon matches the lowest price for books posted online. This is nothing new. If you find a book for a lower price and tell Amazon they lower their price too.